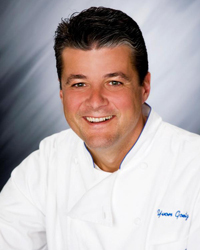 Chef Yvon Goetz is a normal guy – a father, a runner, a friend, a soccer fanatic. Oh yeah, and did I mention he’s an internationally renowned chef? 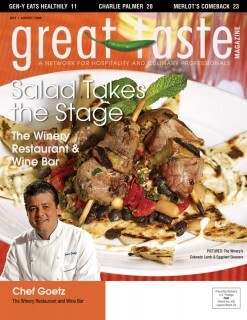 Chef Goetz has cooked for thousands of people in numerous fine-dining establishments across the world. 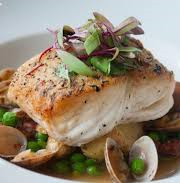 His culinary expertise has helped many of his restaurant homes earn prestigious accolades, from Michelin Stars to AAA/CAA Diamond Awards, and he was even named OC Business Journal’s Chef of the Year. He is unquestionably a sought-after culinary master, highly regarded in all aspects of restaurant culture; something you could never tell if you met him on the street – unless he talked to you about food. I first met with the French-born Chef at his new home, Restaurant in the newly minted District at Tustin Legacy. He greeted me in the entry, where I stood staring wide-eyed at the wine lockers of restaurant’s loyal patrons. We made our way through the spacious dining room to the outdoor patio, where Goetz had been waiting and watching the Champions League Semifinal between his beloved Chelsea and rival Liverpool. We sat in a booth on the beautiful terrace, and over a glass of wine began to discuss his love affair with all things food. Now, if you ask about a person’s first cooking memory, I’m guessing the majority of the answers would have something to do with pancakes, peanut butter and jelly, or chicken noodle soup. When I asked Yvon this question, however, I received a very different answer. He tells me that his grandmother could make anything – “And everything was always made from scratch. She was making everything, from the creme fresh to the yogurt to the fromage blanc – it was just fascinating. She would make something out of nothing.” With a plethora of fresh ingredients being prepared for him from day to day, Goetz was exposed to all types of food from a young age. “You wouldn’t leave the table until you finished everything, so you just tried it all – you develop your taste because you’re trying so many different things.” Apparently, his taste has developed quite well. Yvon’s grandmother certainly has something to be proud of in her grandson. At age 14, Goetz spent the summer working in a restaurant in his hometown, making French fries, hard-boiled eggs and his now famed YG’s Alsace Pizza (aka Tarte Flambee, a dish native to the Alsace region). After two years of culinary school, Goetz packed his bags and moved to Oxford, England, taking a job as a pastry chef at an old historic manor. “Nowadays, it [pastry] is not something that I really like to do much,” he says, but we all have to start somewhere. It turned out to be a great start, and Chef Yvon began to build up his resume, working and earning Michelin starts in different hotels in Leicester, London and South England. He eventually found himself back in Strasbourg, where a tremendous opportunity presented itself – The Ritz-Carlton, Boston needed a consulting chef. Goetz packed his bags, not really knowing how it would work out, and crossed the Atlantic to Beantown. He arrived there in 1991, thinking “OK, let’s not unpack.” In the end, though, Yvon loved the city and stayed there for two years, until 1993 when he transferred to Aspen’s Ritz-Carlton. In talking to Chef about his time in Aspen, I could tell it was definitely a high point in his life. For two years he stayed there, working the world-famous food and wine festivals, meeting “tons of people” through both the Ritz Company and the numerous events, and celebrating the births of his two daughters. 1995 presented another opportunity to transfer with the Ritz-Carlton organization – this time to Laguna Niguel, where Goetz would work as chef of the hotel’s The Dining Room. Yvon became The Dining Room’s guru, boosting the restaurant to Five Diamond status four years in a row and earning Orange County Business Journal’s esteemed Chef of the Year Award. But all good things must come to an end, and in 2004 the restaurant closed. After stints at a few OC eateries, he was approached by JC Clow, now Managing Partner and General Manager of Restaurant. Clow wanted Goetz to be Executive Chef – and the rest is history. Restaurant opened in fall of 2007, a manifestation of the restaurant expertise possessed by Goetz, Clow, and Managing Partner and Sommelier William Lewis. Like I said before, though, Executive Chef Yvon Goetz really is a normal guy. He loves to go out and eat (he frequents CPK with his daughters – their favorite place), his fridge at home is relatively bare, and he has become an avid runner. In fact, food is the reason he picked up running as one of his biggest hobbies. As a fluke, Goetz found out about his high cholesterol at a health fair held by the Ritz-Carlton Laguna Niguel. Laughing, he tells me “The doctor said to me, You should be dead! '” Instead of cutting out all of the rich foods he loved, Yvon began running with one of the servers of The Dining Room. Shortly after in 1999, he completed his first marathon. “You know, you have to find a balance. You want to be able to eat and drink – plus, it’s a great stress reliever before work.” For him, it’s a time to think about menus and be away from the hustle-bustle of the kitchen. You can find him jogging around Newport’s Back Bay, taking in the beautiful scenery and observing the wildlife in peace and quiet – he never listens to music while on a run. “You know, I always have it playing in my office, in the restaurant. It’s nice to just be able to look around without it.” One of his daughters has even taken up running, and is on her school track team – something that definitely makes Goetz proud. There is a silence as I shuffle through my notes in search of one last question for Chef Yvon, but the quiet is cut short when he takes over for me, asking himself, “Do I like wine? Why yes, I do like wine.” He laughs and leans back in his chair, and I decide that there could be no better question to end our chat with. WHAT IS YOUR FAVORITE CONDIMENTOR SPICE: I love all fresh herbs in my cooking, especially basil, chervil and lemon verbena. WHAT IS YOUR SIGNATURE OR FAVORITE DISH TO MAKE? I love to braise meat, such as rabbit, shortribs, etc. WHAT ARE YOUR HOBBIES? Running ½ marathons and marathons, skiing, traveling (when I have time) and eating!